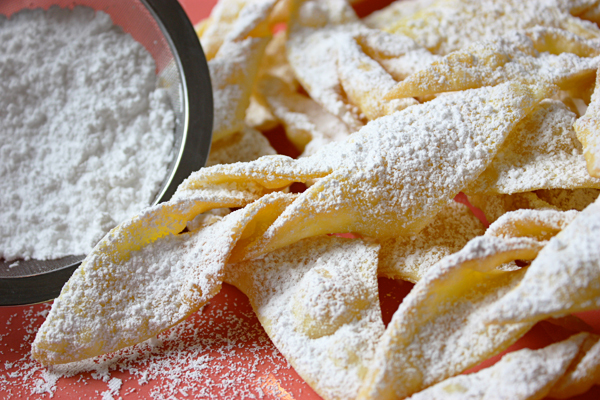 6 Comments on "Polish Faworki – Chrusciki"
I made your angel wings for Xmas and they came out beautiful. I made them again today and my dough was not sticky. It kind of just crumbled. the angel wings came out fine but not as light. I followed directions and did everything as last time. WHAT HAPPENED ???? If they turned out well the first time then you know the recipe works. The problem might be in the way you measured the flour. If you did not aerate it first, you may have used too much flour. Also making two batches may have caused problems. I find it’s not easy to make two separate batches of anything. I suggest you try again making one batch so your focus is only on one, be sure to aerate the flour before measuring (https://www.jennycancook.com/flour-basics/), and see how it turns out. Please let me know. my Italian mother made these every Christmas! These are so good that they are good even with a sweet wine! I have been wanting to make these for years, but did not know what they were called. I have not had them since before my grandmother died in 1966 when I was 5! She was Hungarian (born in Pest in late 1800s) and I thought they were called kieflies, but a search for kieflies always turned up a different cookie. Today I searched images of Hungarian cookies, and voila! There they were. Thank you, Jenny, for showing me hour to make my grandmother’s cookies! I think I’ve had these before, and I really do enjoy them! The ones I made with your recipe last night, came out great ! The way you explained everything and walked us through the steps and even gave the great tips on how to stuff your dough really broke it down and made the process even simpler. I think now that I can make my own, I will be making them myself from now on! Thank you!